SENSOR DDS – The Most Advanced Technology Award ! 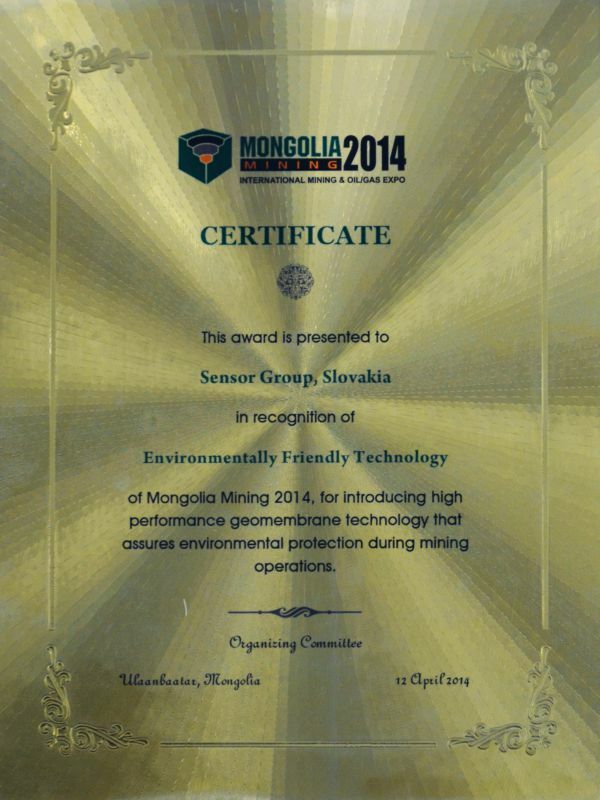 Sensor is proud to announce that its SENSOR DDS® systems have been awarded as the most advanced technology at Mongolia Mining exposition 2014 held in Ulaanbataar. At the exhibition RNDr. Vladimir Nosko PhD. (Sensor’s CEO) and Slavo Spes, MSc. (Head of Operations & Marketing) met Mongolian vice minister Mr.Erdenbulgan Oyun from Ministry of Mining in Mongolia where they discussed implementation of geomembrane leak detection systems to Mongolian mining industry. ‘We want to protect our environment and we will do anything to prevent pollution of our country’ Mr.Erdenbulgan said. We would like to thank everyone who visited us at our booth during days of exhibition and we are looking forward to projects ahead of us in Mongolia. https://www.sensorgroup.com/wp-content/uploads/Award_mongolia.jpg 800 600 Slavo Spes /wp-content/uploads/x-sensor-group-logo-1.png Slavo Spes2014-04-20 09:41:032019-02-28 11:49:59SENSOR DDS - The Most Advanced Technology Award !